He scraped the pale, ochre fleshtones down. She must be placed lower…with more space above. The sky outside his window was a muted, periwinkle blue and it’s light pulled across Laurette’s recline on the carmine sofa. He would have to adjust the drawings above her. Their present arrangement diminished her. He looked at his sketch. The plate would shift, become rounder, to rhyme with Laurette’s hip. And perhaps the bridge should come into the picture as well. It was Paris, late morning, in 1916 and Matisse was in his studio. During the four years of World War I, Matisse worked in his studio at 19 Quai St Michel overlooking the Seine. He was committed to keeping the heart of painting alive while his countrymen artists were away. He sold some prints to send them food and supplies. His two sons were drafted and his little brother was taken prisoner by the Germans, leaving his mother alone in their childhood home. He painted through it all, his palette becoming more somber, shedding the high color that illuminated his earlier Fauvist paintings. 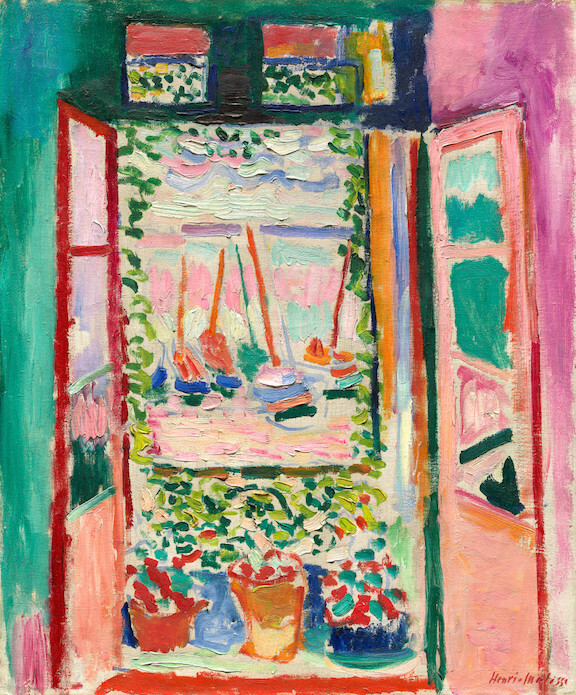 While hunger and restriction hung over Paris and mortar shells landed within earshot of his studio, Matisse painted one of his greatest pictures, The Studio, Quai St Michel. Matisse understood painting as an activity of relationship and integration. The canvas was a living environment. The elements of his pictures were tuned to each other as any living things would be in a shared space. One of the qualities of a highly integrated painting is its’ sensitivity to change. If you alter or remove any element, you can experience the picture shift as a whole system of feeling. The entire arrangement of my picture is expressive; the place occupied by the figures, the empty spaces around them, the proportions, everything has its’ share. When your aims in a painting move beyond the purely representational, visual reality becomes more flexible. The flattened plate gives up a little truthfulness to introduce Laurette’s hip to the curve of the bridge. The circulating forms of drawings, bench, chair and table unmoor and revolve around the reclining figure. The arch of drawings amplify her curvature. She becomes exalted by her surroundings. One of the ways of witnessing the internal, abstract life of a painting is to look at the elements, not only as named objects, but as basic visual vocabulary: line, shape, pattern, value and color. What is being created? A dappled cave and column of daylight. The communication of pattern across space. And when forms are freed from strict object reference, they also become easier to borrow. Picasso painted Demoiselles d’Avignon in 1907. He would wait 9 years for Matisse’s subtle reply. Thank you to Pierre Schneider, Dr. Jean Willette, Dan Franck and Jack Flam for their wonderful writing about Matisse. And thank you for supporting The Drawing Studio. A monthly art journal for Patrons of The Drawing Studio.